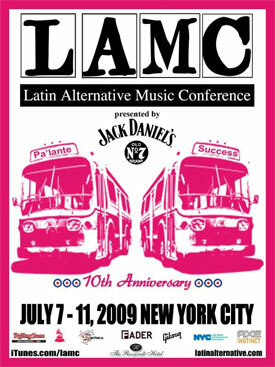 Marco Werman - PRI‘s "The World"
The Latin Alternative Music Conference (LAMC) has announced its full panelist lineup for 2009. This year‘s highly-relevant and timely panels include many of the music industry‘s most prominent decision-makers. With a warm welcome from the Big Apple, the biggest event in the world for cutting-edge Latin music runs from July 7th - 11th. Given the economic climate, the LAMC and Jack Daniel‘s have also joined together to make advance conference registration only $99, proving to be a bargain networking opportunity. Walk-up registration at the conference is $299. Featuring leading artists as well as many of the music industry‘s most prominent decision-makers, the 10th Annual LAMC is a "must play" event for developing and established acts alike. The artists for this summer‘s Central Park SummerStage and Celebrate Brooklyn showcases range from Brazilian samba-funk artist Curumin and Argentine electro-cumbia collective Zizek to Colombian music icons Aterciopelados. "Pioneering and inventive events like the annual Latin Alternative Music Conference are reasons why New York City remains the cultural capital of the world," said Mayor Michael R. Bloomberg. "Through the work of the Latin Media and Entertainment Commission, New York has been able to attract and retain major Latin events that are part of the reason that people want to keep coming to New York City. We are proud to showcase the talent and rich diversity of Nueva York, and look forward to another successful LAMC." With past conferences averaging more than 1,250 music industry attendees and 25,000 concert fans each year, the big 10th anniversary of LAMC promises to be yet another exciting year. The five-day conference provides networking opportunities with the genre‘s leading artists, label executives, journalists, marketers, managers, retailers and programmers, making it the most extensive to be offered by a Latin music conference to date. "We are very excited to be celebrating and sponsoring this year‘s 10th anniversary of the Latin Alternative Music Conference," said Joseph Carvajal, Hispanic Brand Marketing Manager, Jack Daniel‘s USA. "The LAMC represents a great opportunity for Jack Daniel‘s to honor, connect and celebrate with thousands of friends in and outside of the music industry, who value and respect the fraternity, authenticity and independence that Latin alternative music has to offer everyone."